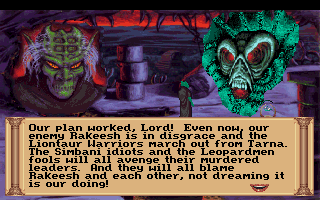 The CRPG Addict: Quest for Glory III: Won! 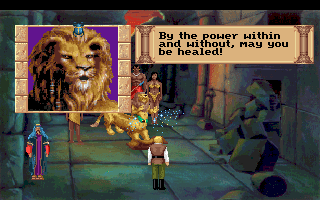 Quest for Glory III: Won! Wages of War wrapped up quickly after my last entry. 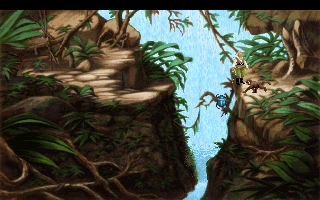 You'll recall that Manu the Monkey and I were on our way to the Lost City to stop the Demon Wizard from opening a portal. I was stuck briefly at a crossing, but the solution was simple: tie a vine around my waist and convince Manu to pull me across while I cast "Levitate." Just as I reach the other side. There was one more fight with a Devil Worm on the way. Repeatedly, Manu tried to convince me to abandon my quest and leave the "bad place," but he ultimately capitulated and told me of a secret entrance that involved putting an "eye that glows" in a jackal's head. However, he refused to enter the city with me and left. If you won't come with me, who are all these monkeys who enter the city "alla time"? Sure enough, I found the jackal mural plus a neaby jackal statue with a fire opal for an eye. A quick "Fetch" got me the eye. 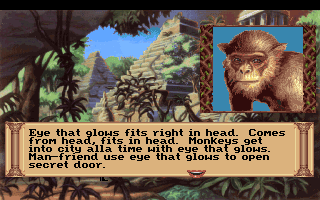 It was interesting to see from Alex's summary at "The Adventure Gamer" that he'd received his eye from a meerbat ages ago. The secret door led to a hall atop a staircase, where two demon goons stood guard, complaining about their lots in life. This reminds me that I never fought an ape man. Alex contended with many of them. A "Calm" spell let me pass the demons unmolested, and an "Open" got me through the door behind them. 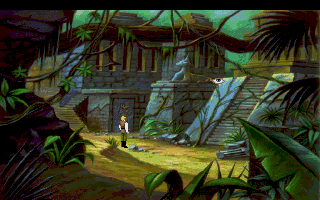 The style of this room seems more like "haunted mansion" than "lost jungle city." 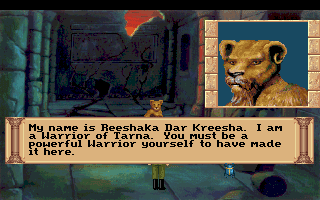 Inside the room was Reeshaka, the daughter of Rakeesh and Kreesha, survivor of the doomed peace mission that never reached the Leopardmen. She told me that a gate atop the tower allows the demons to enter the world, and that we need to destroy the gate. Before we could continue, she was suddenly taken over by a demon. I suspect the thing to do was to throw another "dispel" potion at her, but I didn't have one. I don't know why. Some walkthrough says I was supposed to have gotten three from Salim, but I must have screwed something up. 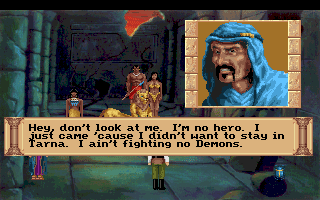 Anyway, I had to fight the demon/Reeshaka in regular combat. It wasnt very hard. 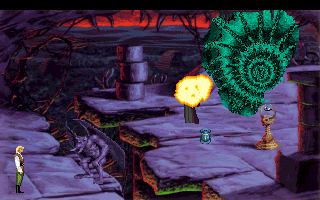 I envisioned this game's demons as quite sinister, but they mostly just look ugly. Shortly after I "killed" him, a portal opened and out stepped Uhura, Yesufu, Rakeesh, my wife Johari, and the thief Harami. Rakeesh immediately called upon his paladin powers to heal his daughter. This is the same thing he did in Alex's game, where Alex did have the "dispel" potion, so I guess it ultimately didn't matter. Alex has a good line-by-line analysis about how your various friends fulfill the prophecy given at the Temple of Sekhmet. I'll let you read it in his entry (CTRL-F "this prophecy thing"). Suffice to say that Harami pretended that he didn't care about anything but himself. Rakeesh expressed some concern that the prophecy wouldn't be fulfilled because he was supposed to have five friends with him, and with Harami refusing to fight, we only had four. Fortunately, Manu showed up to take his place. Nothing better happen to Manu. Uhura and Rakeesh stayed in the previous room to fight oncoming demons (and Harami just stayed) while the rest of us went forward. In the next room, we each came face to face with an enemy in a mirror. The ensuing battle with my doppelganger went poorly. His hit points refused to budge and mine steadily decreased. Then, all at once, Harami came through and stabbed my opponent in the back. Harami shoved some healing and mana pills in my hand and told me to go on and close the portal. In the next room, I found the demon wizard conferring with the demon lord. The wizard was standing on the other side of a chasm, so I couldn't rush him directly. The lord wasn't in the room, but being contacted remotely in his own plane. They had a bit of villains' exposition, confirming that they had orchestrated the war between the Simbani and the Leopardmen as a way to both humiliate Rakeesh and to fuel their orb with deaths. The lord was impatient for the orb to be refueled so he could come through the gate personally. I broke up their discussion by trying to nail the wizard with a "Flame Dart." If only tape recorders existed in this setting. The endgame was something like the wizard's duel in the Leopardmen village. I had to find the right spells to counter the wizard's actions, starting with "Reversal" to counter his attacks. He then cast a spell that caused the floor around me to erupt in flame, but I reversed it with "Calm." Nice alliteration, but also a bit redundant. The next sequence took me a few tries. He summoned a gargoyle, and I had to go through all my spells to find that "Trigger" was the solution, turning it back to stone (why?) He then said he was going to summon his "lord." I tried pelting him with "Flame Dart" and "Force Bolt," but he just laughed off my attacks, calling them "puny efforts." Casting spells on the orb did nothing. One of many possible death screens in this sequence. Clearly, I needed the more powerful versions of the spells that my staff was capable of casting. I summoned it, but he immediately "Fetched" it, and I couldn't "Fetch" it back. For some reason I don't understand, "Trigger" again saved the day, causing my staff to explode in his face and kill him. A burned ball of his ashes floated to my feet, and I kicked it in the chasm. I then "Force Bolted" the orb from its pedestal and into the gate, closing it. I rushed to find my friends and my wife to celebrate. They all had something nice to say until Johari dropped this bomb. How will Yesufu ever be sure that it's his son? Why, you lying, unconstant succubus! After I gave you beads and everything. Yesufu expressed similar surprise, but Johari simply said, "You said you wanted to marry me. I accept." Before I had a chance to react or celebrate any further, some magic enveloped my body and started jerking me to and fro. Those paladin skills really give you an edge, Rakeesh. 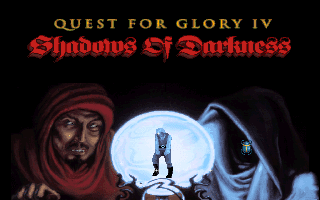 "To be continued," the game said, "in Quest for Glory IV: Shadows of Darkness." The accompanying image showed my Quest for Glory II adversary, Ad Avis, now looking rather undead. A hooded figure next to him is likely the "Dark Master" he spoke of in the previous game. Only about 60 games before we get to it. Chester ended the game with 486 points out of 500. I'm sure the 14 missed points were in various dialogue options throughout the game, or perhaps some were from fighting Reeshaka instead of using a dispel potion on her. I'm not overly concerned. Before we finish up with the game, we're going to have a few replays. I want to experience the game as a thief, and even though I have Alex's account to tell me how a paladin fares, I still need to get my own paladin through Wages of War so he'll be ready for the next one. Ditto the fighter I created in this game. But before I did any of those, I ran through the game again with another wizard. I wanted to see what would happen if I bungled everything--how low a score I could achieve. I wish I hadn't. The whole thing made me sad. I talked to no one I didn't absolutely have to. I offered no "greetings" or "goodbyes." In the forced interactions with Rajah and other characters, I said nothing. I walked away from every scripted scene as quickly as I could. I never even visited the tavern except when I was forced to spend the night there between Days 2 and 3. Rajah reacts to my silence. I ran from every battle I could. I bought no items that I didn't need. I only bought a couple extra waterskins, the items I needed for the brideprice, and some food, for which I paid the talking dog the least amount possible. I threw Shema's note to Shalla in the gutter. I didn't tell Salim about Julanar. I didn't get the honeybird feather for him, either. I refused to swear the oath to bring peace that Rakeesh swore. In the middle of the game, the only things I collected were the items necessary for my wizard's staff and the dispel potions. I never even met Yesufu. 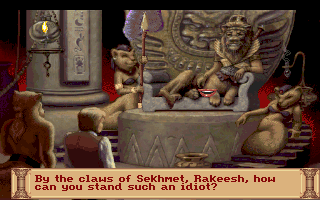 I didn't get the Gem of the Guardian or participate in the Temple of Sekhmet ritual. When I came across Manu the Monkey in his cage, I just walked away and left him there. 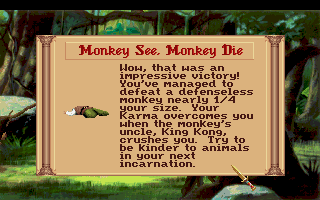 Trying to kill the monkey results in an instant death. After Johari was captured, I didn't give her any gifts. I just opened the cage and let her go. When Johari approached me in the jungle, I immediately said goodbye without speaking to her. Once inside the village, I did everything I could to screw up the encounter. I talked instead of challenging the Leopardman shaman to a duel. I tried to leave. I tried to refuse the duel. But no matter what, Johari yelled at me and funneled me to the duel. Hey, it's called "role-playing," woman. During the duel, I screwed up as many spells as I could without losing. When the shaman was possessed by a demon, I killed him instead of dispelling him. I still got the Drum and then the Spear and the peace conference proceeded as before. The endgame was the most disappointing. 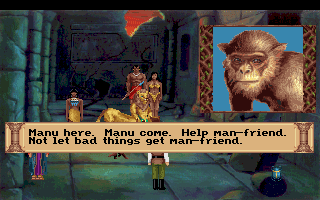 Despite the fact that I'd left him rotting in a cage, Manu still showed up calling me "manfriend," invited me to the monkey village, and took me to the lost city. At the Lost City, I tried to avoid the secret door, but there was no other way to get in. I wanted to lose more points by killing the demons outside the door instead of casting "Calm," but doing so didn't leave me enough magic or hit points to defeat Reeshaka. Of course, after I fought her, the same crew appeared, despite my never having helped Harami or even having met Yesufu. The rest of the game went as above and I "won" with 334 points and an "Honor" score of 53. I'm not sure "congratulations" is the right word here. I understand the Coles' desire to avoid "walking dead" scenarios, but it seems to me they erred too far in the other direction here. To be able to skip so much game content and still achieve the same ending seems unfair to players who put in the time, care, and role-playing. Before the rating, we'll take a look from the thief's perspective. Keep an eye on The Adventure Gamer for Alex's final rating in the meantime! She does (and incidentally, this should make the staff completely useless when fighting other spellcasters, yvxr gur haanzrq pragnhe va gur svsgu tnzr). 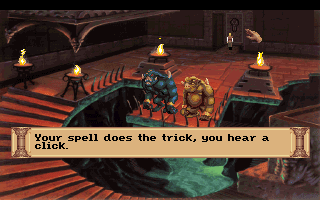 It is unclear why the spell destroys animated statues (like the one in QFG2 as well); the description of Trigger is that it activates latent spells, not disrupt active spells. Okay, I just went through the screenshots of the ritual and you're right: she does say that. "Upon my words, you will cast all of your spells save one upon the magical wood. Do not cast the Trigger spell, however, or you shall unleash all the magical energy within, and destroy everything around here." I think perhaps the reason I didn't remember this is that I thought the danger was only DURING THE RITUAL, and not in a permanent sense afterwards. But clearly, this is supposed to be the clue you need for the end. Oddly, "Trigger" has no effect on the staff in regular gameplay. If I recall correctly (and I may not), the "never cast Trigger on a staff" thing is also mentioned in the manual. I vaguely recall playing for the first time, just waiting for the opportunity. "I understand the Coles' desire to avoid "walking dead" scenarios, but it seems to me they erred too far in the other direction here." Since this game is a RPG and not an adventure, I'd say Lori made the right call. Hi Chet. Long time lurker, first time poster - I think? Anyways, I've been reading for many years and want to pass along the joy I get reading your entries on QFG3. This game came out for me right in a sweet spot of having just enough free time, but (sort of) knowing I should probably not be up at 2am playing it. 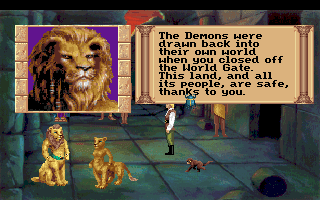 I still hum the various themes to myself sometimes, and seeing Tarna and the map again brought back a lot of great memories. I can also remember the amazing starting menu and frantically scrambling to turn down my computer speakers! Having Corey stop by and comment is also a really great experience -- this is one of only two sites on the internet where I actually look forward to the comments. (A credit to the author of the blog but also his readers) Corey, thank you and Lori so much for this game! 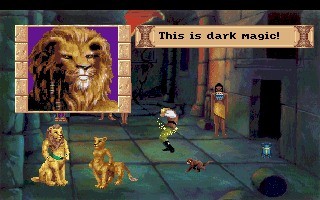 I always played thief but this was the first QFG that I played through as a mage first.. the spells and the whole magic side quest was just great. Still get chills revisiting some of these locations. I was never able to get into QFG4 properly so this game was the highlight of my CRPG gaming youth. Excellent writing -- I learn something every time I stop by the site. Please keep it up! But who plays like "Bad Chester"? Nobody who actually plays the game to get some enjoyment from it. 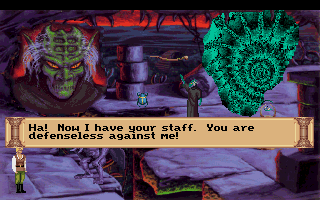 Like all QfG games, this one is a very rewarding experience, if you play it in a reasonable manner. If you play like an idiot, well you probably won't mind the inconsistencies. I suppose that's a decent point. I shouldn't necessarily expect the developers to spend a lot of programming time catering to players who choose to play like jerks. I shouldn't necessarily expect the developers to spend a lot of programming time catering to players who choose to play like jerks. This is a pretty frequent topic of debate among developers, and the answer varies a lot from project to project. In my experience, for single-player story-driven games, the philosophy tends to be: If the player is deliberately playing a nonsensical or non-supported interpretation of the player character, and that play style isn't encouraged by other game elements, then putting effort into supporting that style isn't a good use of limited resources. 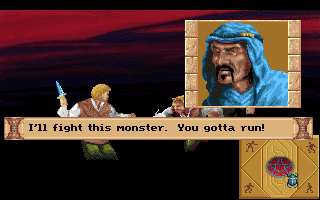 We see and accept this in certain ways all the time--when the Avatar murders a few people in an Ultima game, we don't really expect the larger story to respond to it (but we are delighted when Lord British reacts to us casting "Armageddon.") In Mass Effect, no matter how obnoxious and unlikable I am, people still think of me as a great commander. ...yet because it's so easy to not do those things, it feels like it cheapens the story--and your heroic acts!--to know that you weren't doing a good thing, but just playing your assigned role. If you can't be a miscreant--if the universe just ignores that--what's the value of doing good? But again: limited resources! Would you rather have a "jerk path" that the player is discouraged from seeing, or more fighter / wizard / thief side quests? Does the mere existence of a jerk path encourage the player to try it out, thus missing the thematic point of the game? I don't think there are clear answers to any of this. But they're interesting questions. I think it's important to remember that RPG stands for "Role Playing Game." As in, you are an actor in a story someone else is writing. The idea that you can't be good if you can't do evil is valid when we are talking about real world morality, but the point of playing a role is to inhabit a character within the bounds of an author's vision. If the author says your character is a classic hero, charismatic, caring, brave, and kind, then deliberately taking actions that undermine that vision destroys the collaboration. I don't think game designers should consider themselves required to account for hero characters that don't want to be heroes. If it suits you as an author, go ahead, but honestly I think the idea that the gaming community has this widespread dark side that has to be catered to is due to a minority that is as small as it is vocal. I didn't think Mass Effect was improved by the ability to play as the Punisher instead of Captain America, I didn't think much of the Legion storyline in Fallout 3, and the bolt-on raider plot of Nuka World was just awful. You are the Good Guy, and you're here to save the world, not some murderhobo looking for sick thrills. I think at least with some of the inactions (i.e. not freeing Manu) it would be easy to just add some death screens. "RPG" is just a colloquialism that caught on because it sounded good, not because some wise omniscient council of language elders decreed it so. The genre could have also been called "Braunsteins." So it doesn't make sense to get all hung up on what "role playing" means to you. I like Chester's definition (combat + progression + inventory) because it's meant to apply to the majority of games commonly referred to as RPGs, as opposed to most people's definition which is to exclude all games outside of their own preferred subset. My definition of a COMPUTER RPG is "a computer game that adopts the mechanical conventions of tabletop role-playing games"--of which I consider combat, inventory, and character development the most essential. Actual role-playing has never been a primary feature of the majority of games we call CRPGs, even though I prize it when it's done well. The inventory bit surprised me because I'd never really thought about it that way but it does fit. I have often been told that the role-playing element is that in "classic" computer RPGs, your main characters are created by you and have no backstory or personality beyond what you imagine for them. Maybe some people played the games like this, but when I played the Might and Magic and Wizardry games as a kid, the characters I created were just grunts, I never made up anything else beyond what was in the game. 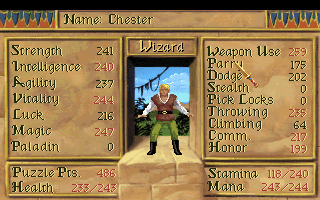 Good effort Chet, but this game isn´t really true RPG stuff. It´s a point n click adventure masquerading as rpg. The visuals and book-like story say it all. Anyhow thanks for telling us all about it. 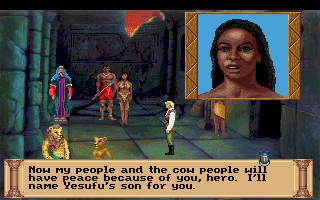 Just as a sidepoint, I hate how it uses animals instead of human cultures. I find it ugly, hard to look at. I think "masquerading" is a bit strong. I do agree that RPG mechanics are somewhat less-used here than the previous titles, the game never pretends to be something it's not. As for your last bit, to each his own. I think the liontaurs and talking monkeys are well within the spirit of the game world that the Coles designed, and I like that world. Neither of them are entirely correct. The QFGs are RPG/adventure hybrids. They've always been hybrids. They make no secret that they're hybrids. In general, they do a good job with the conventions of each genre that they've adopted. Nice job Chet! The mage has a pretty interesting path and I like the emphasis on magic deuls. 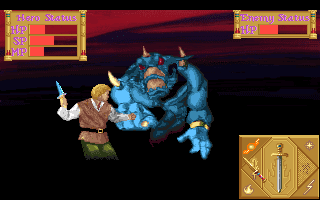 Lastly, re: Trigger turning the gargoyle back to stone during the endgame sequence, isn’t that the same way the magic user gets around the stone gargoyle Ad Avis has guarding him in the endgame sequence of Quest for Glory II? I’m not arguing that I understand why Trigger is the spell that does the trick, just that there is precedent. 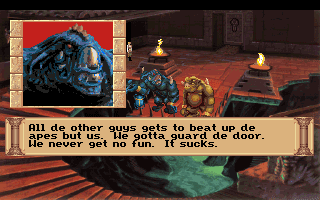 I re-read my own entry for the game, and it appears "Trigger" causes the gargoyle in QFG2 to collapse, not to revert to stone form. I also noted there that I had to figure it out via trial-and-error. 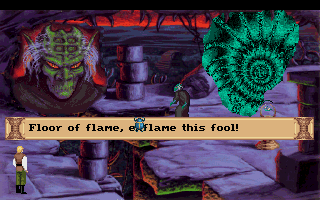 "Trigger" also toggles the size of the magical fire in the Mage's Maze spell in QfG1, so there's some more precent for it having an effect on preexisting spells. Certainly not enough to give it a consistent "counterspell" effect, though. I just figured that had more to do with how Mage's Maze was constructed rather than the "Trigger" spell itself. It would stand to reason that trigger works too activate or deactivate magic, but that's admittedly a thin argument... After all if that were the case trigger should effectively work as a dispel. Why on earth would it stand to reason that a spell has one particular effect and also the exact opposite effect? I don't know... cuz it's magic! If a spell can trigger an existing magical effect to take place, why can't it trigger the same effect to become dormant? Why does the same button on the remote turn the TV on and off? Because it was designed as such to be more convenient. If magic was real I can see why a spell would be designed that way. That recap of playing the Bad Chester was one of the funniest things I've read in a while, thank you. To add to some of the above discussion, I don't think the developers should have "catered" to a jerk playstyle and programmed in "bad" choices. But they should not let pass clear inactions such as leaving someone in a cage and seeing the person greet you as a friend later on. The dialogue choices should eventually all funnel you towards key "choke" points, or else not be there, in such a story-driven game. This is one of the areas where wRPGs are really, really easy to screw up if they're going for a serious plot. A core characteristic of the sub-genre is the player's freedom to interact with the game world in multiple ways, which can be very difficult to meld into a significant plot. If all of your choices boil down to "You see a kitten on the way to the next plot point. You may pet it, ignore it, or eat it", a lot of that evaporates. The best way to do it well is to have fully realized paths for the most likely branches - Bethedsa's Fallout games are a pretty good example of this despite some really wonky bits - you can side with multiple factions all along the alignment spectrum, and there are very few playstyles that won't wind up with you fitting into one of them. This, of course, requires an immense investment in dev time. The easiest way to do it is to have the key plot points being forced, but have your character's motivations and/or reactions vary, along with the exact path you take to get there. Fallout 1 is a good example of this approach. This saves on a lot of dev time, but has the drawback that it only really works with some types of story. This limits the developer's creative liberties. The trap option is to make the different choices purely cosmetic or irrelevant. This works for plot-light games like the Might and Magic series, where there is a lot of room for the player to make up a lot of the motivations and such entirely. If you're trying to tell a detailed story, however, the faux-freedom this approach gives is likely to annoy players more than anything else. In most cases, a more linear jRPG-style story is preferable to this. There are, of course, individual games that transcend these categories - Ultima IV and Undertale are good examples. These also tend to be games that really blur the lines between the sub-genres. Note that for this discussion "wRPG" and "jRPG" are purely referents to genre convention, not place of origin. There are many games produced outside of Japan that deserve the jRPG label, and many Japanese-made games qualify as wRPGs. "A burned ball of his ashes floated to my feet, and I kicked it in the chasm." I think that was his head! Wow, that's gruesome. I don't know why I didn't see it. I can't wait for 2040 when you get round to playing POE2 : Deadfire. I can't think of a single element of the GIMLET it doesn't smash out the park. I appreciate the recommendation. Maybe I'll check it out before then. Can someone explain to me what is a "walking dead" scenario ? From this day forward, I intend to use "Bad Chester" as a verb, i.e. "Time to Bad Chester the UI until I've filled up the change request que.". It would have been nice to have had the luxury to write, develop, and playtest many variations of player strategy including "bad behavior". Quest for Glory 1-4 were all developed in under a year with very small teams by today's standards. The "solution" in other Sierra games was to kill the player character any time the player deviated from the "rails" on which the story ran. Lori and I hated this approach and avoided it whenever possible. At its best, that minimizes suspension of disbelief. At its worst, it sometimes means you simply can't fail. But is that actually true? 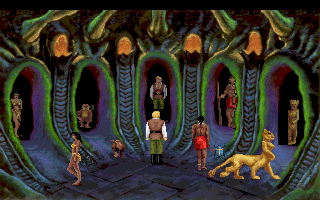 In practice, even Quest for Glory had quite a few player deaths. Some of them were intended to be humorous, but many are serious - you lost a combat, killed a critical NPC such as Manu, etc. Chet, you encountered a number of these in the game, including a few in your "Bad Chester" playthrough. I didn't actually write any code on QG3 - the one piece I contributed was stripped out by a programmer who may have felt I was "stepping on his toes" by claiming to solve a problem he said was unsolvable. Lori also didn't directly write any scripts. She used an in-house message editor to write the game text and dialogue including certain conditions that the scripting system could check. Those messages were thorough in handling actions Lori expected players to take. They were by necessity much thinner in the "player consciously tries to break the game" and "player failed to solve the puzzle" cases. Bob Bates of Legend Entertainment later told us he calls those "error handling", and that makes up 90% of the game scripts. Bob brought in Josh Mandel to help fill out many "wrong", silly, or off-the-wall things players might try. Lori and I focused on the intended player paths. Anyway, still too long a comment, but that's the general idea - given limited resources, we and the development team put a lot of text, time, and effort into the main line of the game, but much less into unlikely behavior. It's all illusion, and a determined player can always break it. This is not to say that "it's all the developers' fault" that a Bad Chester could get much the same rewards as an Heroic Bolingbroke. 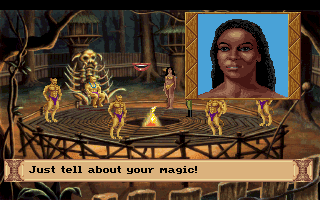 Not at all - they did a great job working on one of Sierra's most ambitious and complex games! Lori envisioned certain ways players would play, and certain tasks they were likely to fulfill, and those were the most clearly defined in the game design docs. Again given the limited development time, not much more than that could have gone into the game. If it had, management would have axed half of it - too many floppy disks killed the game profit. I'm actually rather amazed we got away with what we did, always way above the initially-mandated disk budget. My point isn't to make excuses or justify mistakes made in design or development. I think the QG3 team (of which, again, I was mostly uninvolved) did a fantastic job of bringing the game to life, and of managing to incorporate the essence of Lori's design vision. Looking back on it, or on any of our games, that was a pretty amazing feat. We're attempting the impossible again with Hero-U, and we know that we've only managed to achieve a subset of our lofty goals despite adding four years to the original schedule estimate. Ah, yes. 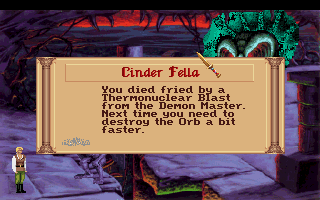 Games from the Legend Entertainment always had well-written and hilarious reactions to non-standard actions and item usage by the player. A far cry from "You can't do that" in most other adventures. I appreciate your thoughts on this, Corey, and partly sorry that the discussion was dominated by my negative experience in the second half of the entry rather than my positive experience in the first. I'll have some more thoughts about this issue in the summary and rating. I think this conversation touches on the different ways we play games. Some players love pulling back the curtain, and will 'save-scum' not because they dislike the challenge but because the challenge lies in trying to get weird outcomes. Others will intentionally avoid actions that could erode the immersive aspects of the game, and play as if the life of their character matters. Clearly a west Chester would focus on many road branches that inevitably lead to the town square, but take different ways giving various views of the town. A Japanese Chester would have only one road to take, but the way the would include pain stakingly manicured landscapes giving a full view of the entirety of town in one trip.